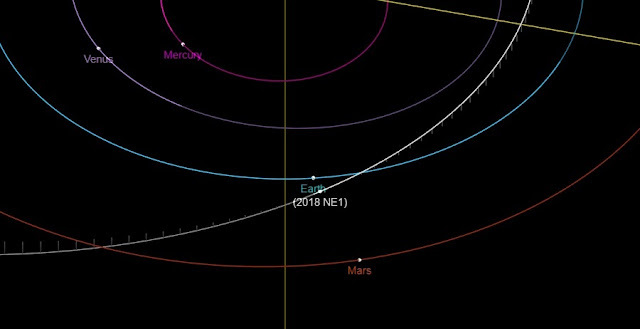 A newly detected asteroid, known as 2018 NE1, is expected to fly by the Earth on Saturday, July 21 at around 11:18 UTC. The space rock will miss our planet with a relative velocity of 14.2 km/s at a safe distance of about 10.04 lunar distances (LD), what corresponds to 3.85 million kilometers. 2018 NE1 is an Apollo-type asteroid first observed on July 8, 2018 by the Asteroid Terrestrial-Impact Last Alert System (ATLAS) at the Mauna Loa Observatory (MLO), Hawaii. ATLAS is an astronomical survey system for detection of dangerous asteroids a few weeks to days before their close approaches to Earth. According to observations, 2018 NE1 has an absolute magnitude of 23.2 and an estimated diameter between 41 and 130 meters. The object orbits the Sun every 2.71 years at a distance of approximately 1.94 AU. Besides July 21 fly-by, no future close approaches of 2018 NE1 to Earth are currently predicted by astronomers. On July 20, there were nearly 2,000 potentially hazardous asteroids (PHAs) detected, however none of them is on a collision course with our planet. PHAs are asteroids larger than 100 meters that can come closer to Earth than 19.5 LD. To date, astronomers have discovered more than 18,500 near-Earth objects (NEOs). Since the beginning of this year, 963 such objects have been detected.